Crochet lace made dress looks unique and absolutely a fresh one among the flower girl dresses. 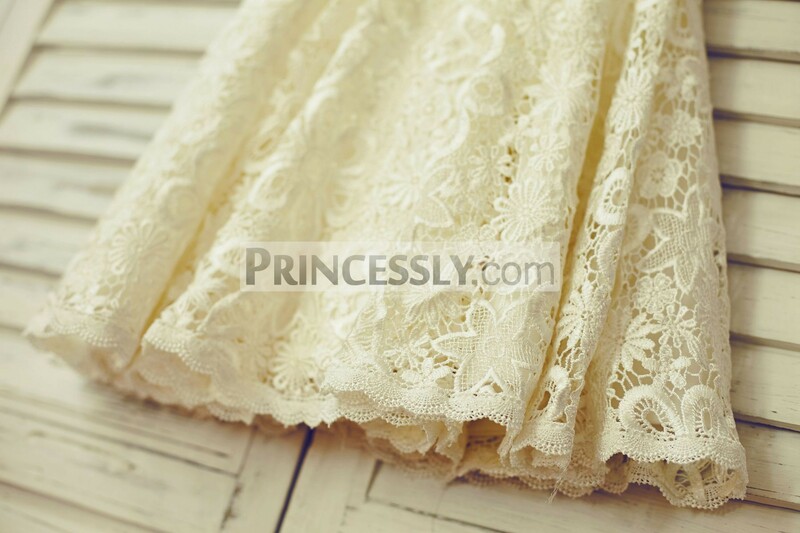 Short puffy sleeves design looks lovely with the hollow-put crochet lace and is freedom to wear in a youthful style. Exceptional detailing in the trim of scoop neckline, sleeves holes and skirt hem make the light champagne flower girl dress more popular. The back has a timeless look with the covered buttons adorned.This light champagne crochet lace wedding little girl dress is truly an innovation for flower girls and this style is versatile to other events. Category: Flower Girl Dresses. Tags: buttoned back, crochet lace, fully lined, light champagne, puffy sleeves. Crochet lace made dress looks unique and absolutely a fresh one among the flower girl dresses. Short puffy sleeves design looks lovely with the hollow-put crochet lace and is freedom to wear in a youthful style. Exceptional detailing in the trim of scoop neckline, sleeves holes and skirt hem make the light champagne flower girl dress more popular. The back has a timeless look with the covered buttons adorned. This light champagne crochet lace wedding baby girl dress is truly an innovation for flower girls and this style is versatile to other events. Be the first to review “Short Puffy Sleeves Light Champagne Crochet Lace Flower Girl Dress” Click here to cancel reply.